Mo. 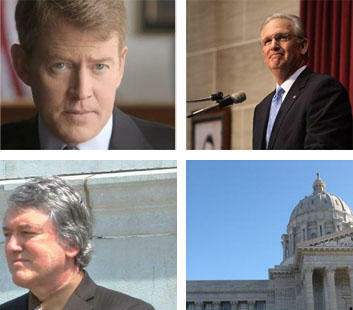 Attorney General Chris Koster (top left), Mo. Gov. Jay Nixon (top right), and Director of the Mo. Department of Corrections George Lombardi (bottom left). Lawmakers have filed bills that would halt executions while the state legislature investigates, and a separate hearing is planned for the Department of Corrections to testify under oath. Lawyers also asked two state Boards of Pharmacy and U.S. attorneys to investigate. But ultimately, who are the government officials responsible for Missouri’s ongoing death penalty situation? We reported late last year that the state has been obtaining its execution drug from an out-of-state pharmacy that’s not licensed in Missouri. New emails show that the Apothecary Shoppe in Oklahoma has offered to supply execution drugs for other states, even if the company isn’t licensed there. In Missouri, an unlicensed seller would be committing a felony. It’s against the law in Louisiana as well, where the Apothecary Shoppe has also offered to sell the drug. Since our report aired, several lawmakers have called for an investigation to see if any laws were broken and who would be responsible if they were. George Lombardi, director of the Department of Corrections, was supposed to testify before a House committee last week. The night before, Lombardi informed the chairman that he wouldn’t be attending and so the hearing was canceled. Lombardi appeared at a different hearing just down the hall that day, though. He assured the chairman of the Government Oversight and Accountability committee that he will make himself available at a later date. According to state statute, Lombardi is the one who’s in charge of finding suitable execution drugs. The director of the department of corrections shall select an execution team which shall consist of those persons who administer lethal gas or lethal chemicals and those persons, such as medical personnel, who provide direct support for the administration of lethal gas or lethal chemicals. The state has attempted to argue that the pharmacy supplying the drug is a member of the “execution team” -- meaning the pharmacy can be kept confidential. A district judge ruled the pharmacy doesn’t fit the definition as defined by statute, but the matter remains unsettled. Regardless, Lombardi played an integral role in approving the Oklahoma pharmacy that isn’t licensed in Missouri. But he wasn’t alone. David Dormire, the director of adult institutions, also assisted Lombardi in finding a drug supplier, as did Matt Briesacher, the department's general counsel. The state has complained about the difficulty they’ve had in locating a company willing to supply them with a drug for an execution. Dormire contacted three pharmacies. “Two indicated that they did not have pentobarbital. The third indicated it did by compounding it,” he said. Dormire said he didn’t do any investigation into the pharmacy’s license to sell. He also testified that he still isn’t aware if the pharmacy is licensed in Missouri, which it isn't. Members of the so-called execution team are paid thousands of dollars for their service. “I take them cash,” Dormire said. 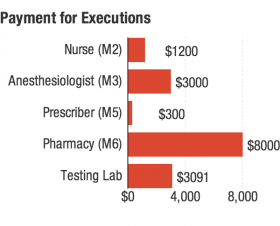 In total, members of the execution team are paid more than $15,000, all of which is delivered in cash by Dormire. For payments more than $600, the department must issue a form for the Internal Revenue Service. “Well, they -- you provide the IRS with proof that they’ve been paid, do you not?” Dormire was asked in a deposition. “I do not know,” Dormire responded. “I don’t know,” Dormire said. Read the filing below or click "Notes" for the important parts. Gov. Jay Nixon appointed Lombardi to his post. And Nixon was the one who asked the Department of Corrections to come up with a new execution drug and method. When the Department of Corrections came up with a new drug in October, it announced that the supplier would be kept secret. In previous interviews, Nixon has defended the secrecy. “I feel like the Department of Corrections has come up with an appropriate protocol,” Nixon said in November. "I think we’ll stick with the protocol as designed." The governor has denied that he asked Corrections to hide the supplier and has deferred questions to the Department of Corrections. Nixon discusses the controversy surrounding executions on Jan. 23. But emails obtained by St. Louis Public Radio and the Beacon show that Nixon’s office has played an important behind-the-scenes role in how executions are handled. We asked the governor’s office for emails between that office and the Department of Corrections. After more than two months (and a letter from our lawyer), the governor’s office fulfilled our request. Most open records requests are supposed to be fulfilled within three days. The 200 pages of emails paint a picture of a governor’s office in regular communication with corrections. The Department of Corrections submits what appear to be daily and thorough updates to the governor’s office -- giving it information on any press questions it receives and any open records requests it gets. In one email, Lombardi asked the governor’s office for guidance on who should field questions from the press. “It is a moment when the governor and our agency’s credibility is on the line,” he said. In a later email, Lombardi was stressed about who would be handling the press. The emails went to members of Nixon’s communications department, as well as Michael Barrett, a senior legal advisor to the governor. Barrett has also been in discussions with the Missouri Board of Pharmacy. Before our investigative piece aired late last year, we offered the governor’s office, the attorney general and the Department of Corrections the opportunity to comment. We also reached out to the Missouri Board of Pharmacy to see if it would be looking into any possible illegal activity in how the state procured its execution drug. Shortly after our email to the board, the director, Kimberly Grinston, received an email from Barrett in the governor’s office. The email was completely blank, but the subject line told her to give him a call. The board ended up not speaking to us for the story. Grinston declined to say what Nixon’s advisor wanted to discuss with her over the phone. Last Wednesday, the pharmacy board dismissed the complaint over the execution drug supplier, citing the “unknown identity of the alleged entities.” Members of the Board of Pharmacy are appointed by the governor. The Department of Corrections wouldn’t have been able to buy its execution drug from a pharmacy not licensed in the state if the source wasn’t secret. And the source wouldn’t have been kept secret without the efforts of Attorney General Chris Koster’s office. Koster’s office has fought hard for the secrecy, which remains a point of contention in the case before the courts. The attorney general argues the pharmacy is a member of the “execution team” and that the identity of a lab testing the drug is a state secret. Most of the time, the designation of state secret is reserved for matters of national security. Koster is now arguing that new information regarding the unlicensed seller and questions regarding improper storage of the drug shouldn’t affect the execution. “There is nothing really new here,” Koster’s office wrote in a court filing last Friday. Koster points to a report from an anonymous testing laboratory to argue that the drug is sterile and pure. But a previous federal judge did not find this evidence convincing. On Wednesday, we found out the testing lab is one that’s faced controversy in the past. Analytical Research Laboratories (ARL), in Oklahoma City, OK, approved a batch of steroids for commercial use that ended up killing dozens in 2012. And in this instance, the analysis by the anonymous testing laboratory occurred on the Jan. 22, a full week before the execution. If the drug is still being stored at room temperature during that period, it would still be in violation of pharmaceutical practices. The attorney general's office has also been in discussions with the Oklahoma Board of Pharmacy, which dismissed a request to investigate the Apothecary Shoppe. The emails refer to a prior conversation between the two agencies, which an Oklahoma Board of Pharmacy official told me is based on a phone call, "which I do not have to disclose to you." In the next few days, each of the three agencies -- Corrections, the governor’s office and the attorney general office -- will play their assigned roles. Corrections will have the actual execution to carry out, the governor’s office will have to handle clemency and offer guidance to the department on how to handle the press, and the attorney general will have to convince the courts that Missouri’s new execution method is constitutional. Provided the attorney general is successful and the governor denies clemency, the state is set to carry out its first execution of the year on Wednesday.